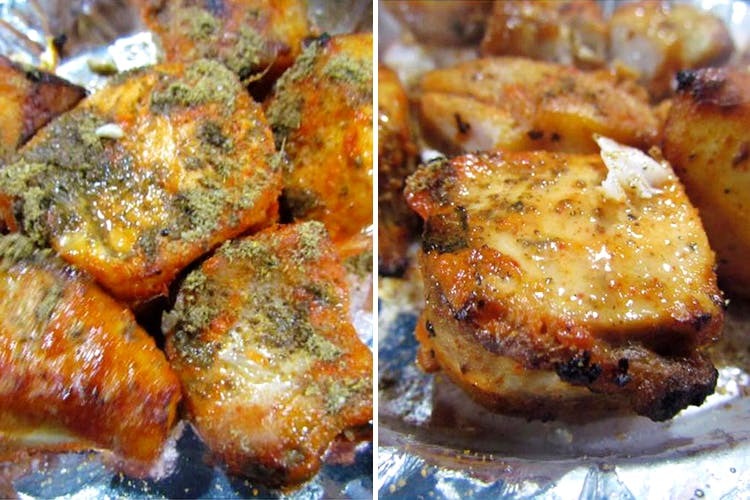 Winter is here and for most of us, it’s the perfect time to eat fish tikka! The delicious dish is a signature at every Punjabi wedding and makes for a great pair with a pint of beer on a chilly winter evening as well. The perfectly done fish with green chutney on the side is available at Old Railway Road’s Pappu Fish Corner. In the hustle and chaos of old Gurgaon, there exists a corner known for serving satiating fish preparation for the last 30 years. Pappu Fish Corner is more than a food joint for many people in the NCR region. It’s a habit and has been for decades now. It offers a focused menu; serving surmai fried and surmai tandoori. They sell it all by the weight. For instance, one must order a minimum of 250 grams of the tandoori offering and 100 grams for the fried one. But it all starts at the reasonable price of INR 175, so we don’t mind. The joint is famous for its quick service and garnishings such as the mandatory green chutney, onions, chaat masala and lemon juice sprinkled over the fish creates a spicy and appetising snack. They prepare the fish right in front of your eyes and the result is almost always a beautiful, flaky, juicy, tender and flavour rich plate of fish tandoori or fried. Pappu Fish Corner offers your essential Omega 3 amino acids with a spicy twist and with the winters right around the corner, the piping hot fish would be the perfect way to welcome the new season.